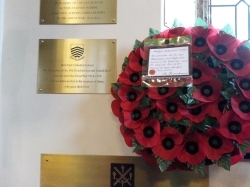 In the stillness of St George's Memorial Chapel, Ypres the School's Senior Chamber Choir sang most beautifully as they and guests attended a service at which the School's plaque was dedicated. Mr Ege Parker and The Old Herefordian Club had commissioned the plaque to recognise all the OH's who fought in the First World War. After the service and in perhaps one of the most moving events of the day in Ypres, the choir sung the staggeringly beautiful "For the Fallen", those famous lines,"They shall grow not old as we that are left grow old: Age shall not weary them, nor the years condemn. At the going down of the sun and in the morning, We will remember them" set to music by George Guest in the arch of the Menin Gate beneath the names of lost OH whose bodies were never found.